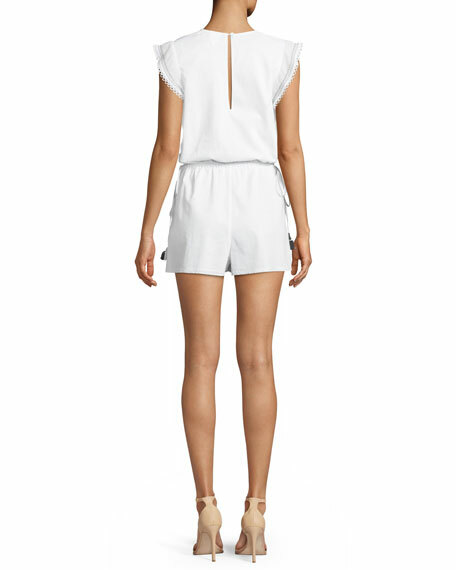 Kisuii "Lian" romper with embroidered trim. Elasticized waist with tassel ties. Globally neutral aesthetics combined with fabrications designed for comfort, luxury and beauty. Washed silks, cotton voile, gauze and novelty laces, embroidery and trims. Designs that are equally at home in the lap of luxury, always with the ready-to-wear customer in mind. Kisuii is modern, easy, playful and feminine. For in-store inquiries, use sku #2498301.